The upcoming UN-sponsored Durban Review Conference tests America's willingness to offer global leadership to combat bigotry and injustice. 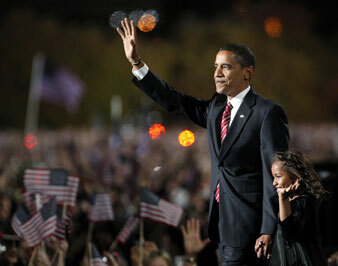 Barack Obama and his daughter Sasha celebrate his victory on election night, November 4, 2008. In 2001 I traveled to Durban, South Africa, to join the tens of thousands of people who came to participate in the United Nations-sponsored World Conference Against Racism, Racial Discrimination, Xenophobia and Related Intolerance. More than 2,000 came from the United States, a rainbow of people crossing all lines–racial, ethnic, national, language, immigration status, religious and much more–joining an equally diverse crowd from across the globe. It was an extraordinary opportunity to meet, discuss, argue and strategize over how to rid the world of these longstanding evils. Our participation paralleled that of the official US delegation. And that’s where we faced a huge challenge. The Bush administration team, having only grudgingly agreed to participate at all, made clear they had no real commitment to fighting racism or offering leadership on other challenging issues of discrimination. When they didn’t like a few small parts of the sixty-one-page text, they packed up and walked out of the conference. It was a sad but hardly surprising moment, exposing once again the history of US failures to take seriously the consequences of its own legacy of racism, a point most recently made by Attorney General Eric Holder. Now, eight years later, the United Nations is convening the Durban Review Conference in Geneva April 20 to 24 to review and assess the progress since 2001. Member nations have toiled for two years to craft an outcome document that assesses the current analysis and challenges. This document–which called for particular measures to provide support and reparations to all the victims both of long-ago histories, like the descendants of the European-Atlantic slave trade, and those facing contemporary forms of discrimination and apartheid policies, such as the Roma, the Dalits (India’s “untouchables”) and the Palestinians–was rejected by the Obama administration. This year we thought things would be different. Our country has taken a huge step in our long struggle against racism: we have elected our first African-American president. And perhaps more important, the mobilization of people who made Barack Obama’s election possible brought more young people of color into political action, with others of various ethnic and political backgrounds, than perhaps any campaign before. It is a moment not to sit on our laurels; certainly, we have much farther to go. But it is certainly a moment for our nation’s political leadership to acknowledge a new marker in the long and painful struggle for justice, and a time to offer global leadership in the United Nations forum organized to combat bigotry and injustice. In an effort to address the administration’s concerns, the United Nations has released a new “outcome document,” stripped of all language deemed offensive or controversial. Yet we face the sad reality that our president, the first African-American to lead this country, who has galvanized hope among victims of injustice around the world and encouraged them to stand up with dignity for their rights, has yet to indicate if he will send an official delegation or continue to abstain from the entire process. Our historical struggle against racism can claim great progress as a legacy of the civil rights movement led by the likes of Fanny Lou Hamer and Dr. Martin Luther King Jr., but this 2009 review of the 2001 Durban conference against racism should still be a moment in which the administration of President Obama returns to the world stage to join deliberations aimed at making even further progress against injustice. For twenty years, Congressman John Conyers, dean of the Congressional Black Caucus, has annually introduced a bill urging the United States to form a commission to study whether reparations are an appropriate response to the continuing legacy of slavery in our country. Would not the Durban Review Conference be a perfect venue to the administration to support the remedies recommended by the global community of nations to overcome the impacts of racism, slavery, anti-Semitism, apartheid and other forms of discrimination? Would this United Nations conference not be exactly the right place for our new president to show the world that his administration’s commitment to “change we can believe in” means rejecting our country’s tarnished legacy of violating international law, undermining the United Nations and using American exceptionalism to justify walking away from the leadership responsibility many in the world expect of the United States? To make that change clear, wouldn’t this be a great opportunity to remind the world that even if the final document does not call out the name of every perpetrator government, the United States at least believes that every group of victims facing discrimination or worse based on their identity, especially the most vulnerable, and those who are stateless and thus in need of special attention by the international community, should be named and promised assistance? This should be a moment for the United States to rejoin the global struggle against racism, the struggle that the Bush administration so arrogantly abandoned. I hope President Obama will agree that the United States must participate with other nations in figuring out the tough issues of how to overcome racism and other forms of discrimination and intolerance, and how to provide repair to victims. Our country certainly has much to learn; and maybe, for the first time in a long time, we have something by way of leadership to share with the rest of the world in continuing our long struggle to overcome. Danny GloverDanny Glover is an actor/activist and chair of the TransAfrica Forum Board of Directors.